Ostensibly, Red Moon tells the secret story of the Soviet race to the moon. Filling the novel with historical details, Cassutt showcases key events, both successes and failures, and makes sure that the reader understands the highly complex bureaucracy that paradoxically managed to both drive and hamper the program. As a result, Cassutt is able to paint inferences as to why they failed and what might have allowed the program to compete more effectively with the Americans. More impressively, even though we know the outcome of the space race — even if you didn’t, the narrator tells the story as a series of remembrances, detailing 30-year-old events — Cassutt amazingly conveys a true sense of urgency and engages the reader by showing that while the events were taking place there were times when it appeared to those involved that the Soviets would get there first. Yet, while Red Moon covers the whole Soviet space program, the heart of the novel is really Yuri Ribko, an engineering student who joins the civilian wing of the space program straight out of Bauman Higher Technical School and dreams of someday actually going to space himself. But like the space program itself, subject to a constant struggle between its civilian and military arms, Yuri almost immediately finds himself working under two different bosses. Although he obtained his position through Vasily Filin, an engineer at the Experimental Design Bureau and one of Ribko’s instructors at Bauman, Ribko quickly ends up working in secret for his Uncle Vladimir, an official in State Security, as well. Paralleling the space program’s leadership leaders, working under two different bosses starts to tear at Ribko. His deep loyalty to Filin, whom he considers his mentor, is sometimes at odds with Uncle Vladimir’s requests for as much insider information as possible concerning events in the Bureau. It quickly becomes obvious that life for Yuri is extremely difficult. In fact, Cassutt brilliantly shows how difficult life for everyday citizens in the Soviet Union was, even under optimal conditions. The government is never criticized out loud, everything is rationed, and if you hold a job of any importance, you are expected to attend party meetings on a regular basis. Additionally, one is expected to regularly volunteer to assist in public work programs, which usually mean exhausting physical labor. These everyday expectations were tough for most living in the Soviet Union, but Yuri quickly finds he has little personal time to call his own when he must combine these responsibilities with the rigors of essentially working two different jobs. This lack of time ends up complicating matters in Yuri’s personal life — in particular, his relationships with his father, World War II combat hero Colonel-General Nikolai Ribko, and with his girlfriend Marina. Without giving any reasons, the General keeps cautioning Yuri against getting involved in his uncle’s business and is constantly checking up on him at Star Town, the Soviet equivalent of Cape Canaveral. More importantly to Yuri’s personal life, his relationship with Marina begins to fall apart as he spends more time at his jobs and less time with her. Eventually, she ends up pregnant as the result of an affair with Lev, a friend and college roommate of Yuri’s whom he had arranged to get a job in the space program, and ultimately leaves Yuri for him. Yuri’s personal and professional lives are so intertwined that there really is no way to separate them, and his life as a whole begins to resemble the Byzantine complex that controls the space program. For instance, after agreeing to help his uncle, Yuri lies to his father about his dealings. Later, to acquire his father’s assistance, he ends up confessing and promising to end his associations with his uncle. But when Lev is falsely arrested on sabotage charges and turns to Yuri to help clear his name, Yuri discovers the power that his uncle still holds over him. Intrigues like this make Yuri ultimately a sympathetic protagonist. Even though he makes bad and sometimes even stupid decisions, such as when he confronts his uncle and accuses him of killing Soviet space hero Yuri Gagarin — whose historical and officially stated cause of death remains mysterious to this day — he truly comes across as a man who finds himself in extraordinary circumstances that are beyond his control. Yes, as the son of a war hero and the nephew of a high-ranking official in State Security, Yuri does have privileges and access to assistance that most Soviet citizens don’t. However, using those privileges often brings about negative consequences — for instance, getting Uncle Vladimir’s help in getting the charges against Lev dropped means that Lev must leave the program. Throughout it all, Yuri fervently does whatever it takes to keep the program and his dreams moving forward. 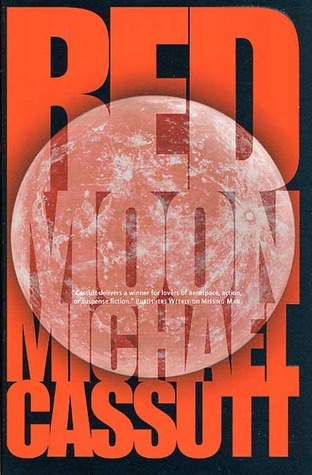 If there is a flaw in Red Moon, it is the structure of the novel itself, which is told as a series of flashbacks interspersed with a dialogue on how the writer, a fictionalized version of Cassutt, gleaned the historical events and Yuri’s story. While Cassutt seemingly uses the contrast between past and present to show how much Russia has changed since the fall of communism, it also interrupts the flow of the novel. Returning to the story after one of the narrator’s interruptions almost feels as though you’re returning from a commercial break. Furthermore, the final snippet of story from the present, which is something of an epilogue, comes across as a forced attempt at a happy ending for Yuri and Marina. Because the happy ending neatly ties up Yuri’s story, the big question truly left at the end of Red Moon concerns the ability of the Soviets to eventually put a man on the moon. The easy assumption is that the absence of an actual manned mission shows that they lacked the capability. Yet, with all the technical information scattered throughout the novel, Cassutt makes it clear that the pieces for actually attempting a manned moon landing did exist. He also makes it clear that the horribly inefficient system that governed the space program ultimately doomed the attempts. One of the beauties of this novel is that Cassutt never fully answers the question of capability. Instead, he give the reader enough information to decide whether the Soviets could have succeeded if they tackled the problem differently or whether their space program was doomed to failure because no other structure was possible under the constraints of the Soviet regime. It’s an intriguing question, and while the story of Yuri Ribko is a fascinating one, it is that question that makes Red Moon an especially worthwhile read. Click to purchase Red Moon on Amazon.com. This entry was posted in Book Review, Matthew Appleton, Michael Cassutt. Bookmark the permalink.